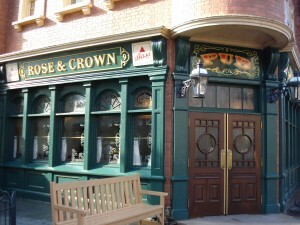 Cheerio and welcome to the Rose and Crown Pub and Dining Room! This cozy little pub offers a hearty, delicious menu of your British favorites, including cottage pie, fish and chips, and the pints you can’t get anywhere else in America. I can highly recommend this reasonably priced restaurant. After slipping in food quality for a few years, it’s back full force with a new menu and great service. The menus include all your favorite brews, scotches, ciders, cognacs, and dishes from the jolly old (and contemporary!) United Kingdom. Try a pub blend for the ultimate in brew-mastery! The pub and the dining room are, technically, separate from one another. Be sure to make an Advanced Dining Reservation to dine in the dining room. Pub is first come, first served. Occasionally, the pub has entertainment, such as the Hat Lady. Keep an eye out! If the pub and dining room are packed, Yorkshire County Fish and Chips is to the right of the restaurant while there’s a small, outdoor bar serving up brew to the left of the restaurant. Many folks like to book a reservation just prior to the Illuminations fireworks and take their chances getting a table outside on the patio. It’s a risk, but the reward is gorgeous. We recommend booking a reservation for around 7:30pm and requesting a patio table at the podium. Illuminations begins at nine, so let them know you’ll wait as long as you can to snag one of those coveted outdoor tables. Famous Dishes: Brews: Boddingtons, Guinness, Hoegaarden, Tennant’s, Strongbow, and more. Dishes: Fish and Chips, Scotch Egg, Bangers and Mash, Cottage Pie, Mushy Peas, Sticky Toffee Pudding.